Performance art at the MFA on April 30. Overcoming both administrative roadblocks and censorship, Cuban artist Lázaro Saavedra performs Funerary Egocentrism at the Museum of Fine Arts, Boston (MFA), on Wednesday, April 30. The performance piece, prohibited by cultural authorities in Cuba in 1990, was originally scheduled for the opening night of Permission To Be Global/Prácticas Globales: Latin American Art from the Ella Fontanals-Cisneros Collection––marking the first time the MFA has included a performance piece on an exhibition checklist. However, the work was postponed due to administrative delays with Saavedra’s visa. 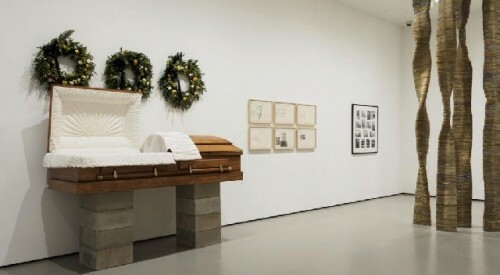 In the performance, the artist will lie in a casket in the Foster Gallery––paying sarcastic homage to the “death of the author” (i.e., himself). Visitors can RSVP to the event on Facebook. Also included in Permission To Be Global is a performance by Guatemalan artist Regina José Galindo on Wednesday, June 25 (details to be confirmed). A panel discussion related to Permission To Be Global on Wednesday, April 23, is presented by the MFA and Harvard University's Department of History of Art and Architecture. Guests can RSVP for Local Globalisms: Panel Discussions on Art from Latin America on Facebook, which is followed by the book launching of Guatemalan artist Darío Escobar's first monograph. Performance art at the Museum encompasses a spectrum of live interactive experiences, and includes a range of works by local, national and international artists. In January, the Museum unveiled its first acquisition of a performance artwork—an outdoor installation of Argentinean artist Amalia Pica’s Now Speak! concrete lectern. The work invites impromptu performances by MFA visitors and passersby, and is on view through July. Visitors can activate the work with a speech of their own and enjoy the spring weather!